The most powerful eagle in Africa. 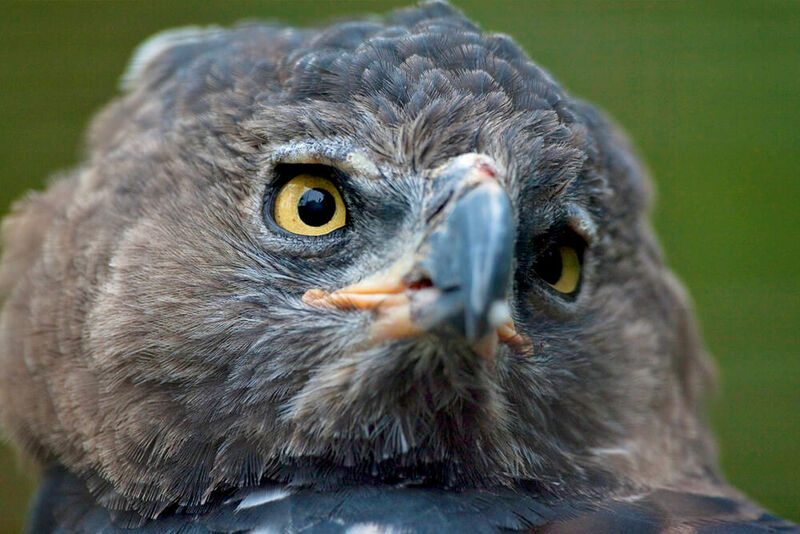 Crowned eagles are not the largest eagles in Africa—martial eagles claim that title—but they are the most powerful. Their legs are thick, and they have a very long talon on each back toe that helps them kill animals more than four times their size. Crowned eagles live in the tall woodland forests and rain forests of Africa. They are often seen on Africa's savannas as well. Built for flying among trees, the crowned eagle's wings are short and broad, and its long tail helps guide the bird like a rudder guides a boat. These features allow the eagle to fly easily through the branches. Adult crowned eagles have a dark brown head with long crest feathers tipped in white, a cream or reddish breast with black bars, and wings that are black on the top and reddish underneath. Like many raptors, the female is larger than the male. Calling loud. Crowned eagles are known for their cry. They call out often in a very loud voice. The male’s call, “kewee-kewee-kewee,” is higher pitched. The adults and chicks both call to each other at the nest, especially when the parents bring food for their young. Crowned eagles live in forests, mountains, and grasslands in southeastern and Central Africa. Hunting big game. 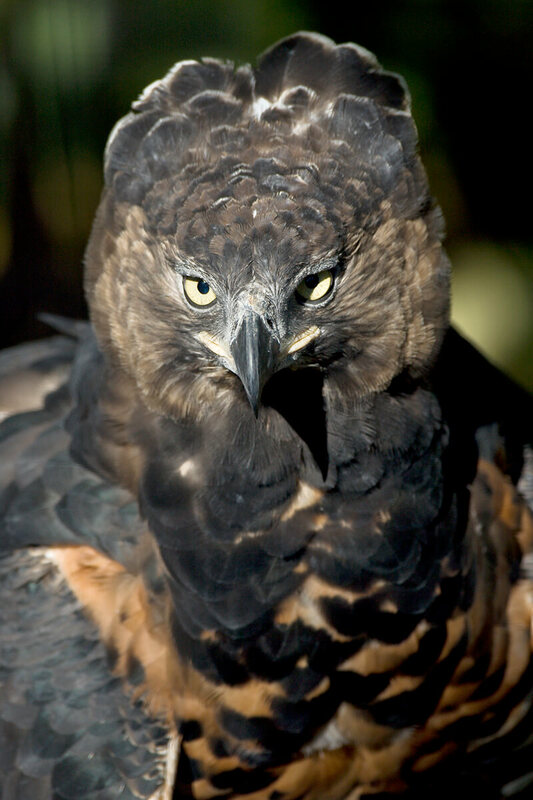 As the most powerful eagle in Africa, the crowned eagle is able to kill animals weighing up to 44 pounds (20 kilograms). The eagle's long hind talon helps break the prey’s spine. A favorite method of hunting is to sit in a tree overlooking a waterhole or clearing and then simply drop down onto the prey. When hunting monkeys, a crowned eagle flies over the forest canopy until a troop of monkeys can be heard. The eagle lands on a branch and tries to get as close as possible to the monkeys without being seen before attacking. A crowned eagle pair may hunt together: the male flies high and calls out to get the attention of monkeys in the trees below; the female then skims the treetops and grabs a confused monkey. They prefer to carry their kill into a tree to eat in safety, but they can't carry anything heavier than themselves. If the kill is too heavy, it will be torn apart on the ground and the pieces stored and eaten over several days or brought back in pieces to the nest. Crowned eagles also eat small antelope, mongooses, feral cats, rats, monitor lizards, and snakes. At the San Diego Zoo, our crowned eagle is offered a large rat three times per week and a rabbit once a week, supplemented with a liquid vitamin E injected into the rat or rabbit after it thaws. Like many eagles, the crowned eagle male performs a beautiful courtship flight to impress a female. He flies very high into the air and makes a series of swooping dives and climbs, like a roller coaster. At the top of each loop, he flaps his wings quickly several times, throws his head back, and calls loudly for up to 30 seconds. If the female joins him, they may lock talons and cartwheel down toward the ground, only letting go at the last second. At the nest, the male displays for the female by running around her with his wings raised. Breeding usually occurs between July and October, after the rains have stopped. A forever home. The pair uses the same nest for many years until a new pair inherits it. The nest is made of sticks and lined with fresh, green branches. The eagles add new material to the nest each year, and over time the nest can grow up to 8 feet (2.4 meters) across and 10 feet (3 meters) deep. It typically rests in a 40- to 150-foot-tall (12 to 46 meters) tree. Natural selection. 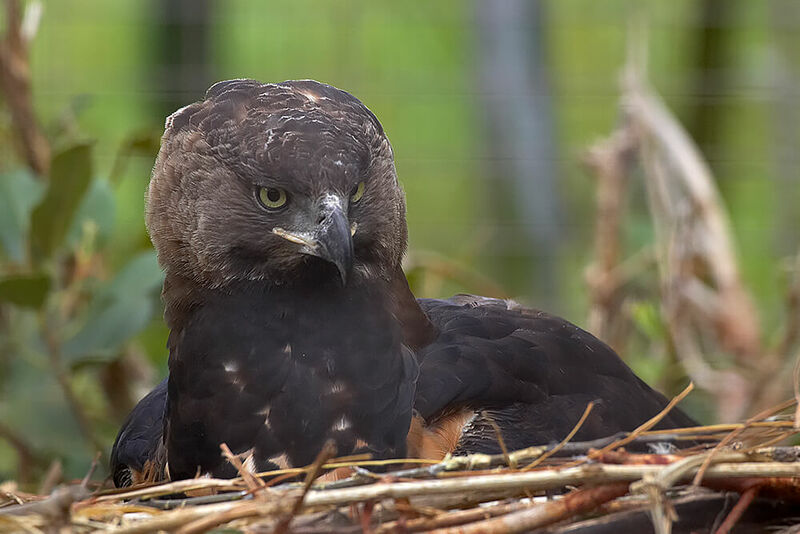 The female crowned eagle lays one or two eggs, which are white and speckled with reddish brown. She incubates the eggs for most of the next 49 to 51 days while her mate brings her food every 3 to 5 days. Sometimes the pair swaps roles. The chick hatches, covered in down, and develops its first feathers at about 40 days. If there are two chicks, the stronger (usually the firstborn) kills the weaker one soon after hatching. The father brings fresh branches and food to the nest for the first two months, and both parents are very good at protecting their baby. If anything approaches the nest, the parent attacks it fiercely. The chick swallows all the bones in the prey that the parents bring, including leg bones that often sit in the chick’s throat until enough of the lower part of the bone in the stomach is digested so that it can swallow the rest. Growing into the crown.The chick's crest feathers (or crown) appear at about 2 months of age, and it has all of its feathers 76 days after hatching. The young crowned eagle starts wing-flapping exercises to strengthen its flight muscles at 40 to 50 days old and is ready to take its first flight by the time it is 4 months old. The youngest crowned eagle seen to make a kill on its own did so 61 days after fledging, but more often the parents feed the juvenile every 3 to 5 days for the next 9 to 12 months while the youngster practices its hunting skills. Because the youngster is dependent on its parents for so long, the mated pair must wait another year before breeding again. This means the pair usually raises only one chick every two years. A juvenile crowned eagle looks very different from an adult. It has light gray-brown feathers on its back, and its wings are edged in white, making the bird look like it has scales. Its head, breast, and belly are white, and its wing and tail feathers have gray bars. By the time it is three years old, the young crowned eagle has changed into its striking adult coloration. The Zoo’s founder, Dr. Harry Wegeforth, obtained our first crowned eagle, a female, in Nairobi in 1930. The world’s first zoo-born crowned eagle hatched at the San Diego Zoo in April 1996, and the parents went on to produce five more offspring over the years. Today, we have a male crowned eagle that can be seen across from the bonobos in the Zoo’s Lost Forest. Crowned eagles are fairly common throughout their range, since they prefer thick forests where people don't usually live. If they venture out in open lands where livestock is normally found, they are sometimes shot by ranchers who fear the eagles might prey on their livestock. But since crowned eagles prefer forest habitat, their greatest threat comes from people destroying those forests and killing prey animals the eagles need. You can help us bring other eagle species back from the brink by supporting the San Diego Zoo Global Wildlife Conservancy. Together we can save and protect wildlife around the globe. A crowned eagle can swoop after prey in the air at 100 miles (160 kilometers) per hour yet brake to a halt within 20 feet (6 meters). It pushes its powerful wings against the air currents to slow down. The crown feathers of the crowned eagle are valued among African tribesmen as ornaments. The flight of the crowned eagle is remarkably quiet, much like the silent flight of owls. The crowned eagle is the only surviving member of its genus. The Madagascar crowned hawk-eagle died out about 1,000 years ago after humans arrived in Madagascar and hunted its main prey, giant lemurs, into extinction.